For those who are looking to do a government internship, there are many programs available online. Many of the government internships listed are paid or at least offer some form of benefit or stipend. Government internships are available at the local, state, and federal level. 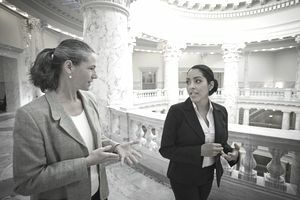 For local government internships, many congressional hometown and DC offices seek interns to work alongside the regular staff. For state internships, it’s a good idea to check out internship opportunities in the capital city of your state. At the federal level, there are many chances to get internships in Washington DC where they offer a vast variety of opportunities for students. Internships are a great way to find out about what’s going on behind the scenes in government offices and agencies throughout the country. Getting exposure to what’s actually happening rather than what is portrayed in the media can be an eye-opening experience for interns. Completing an internship in government is a great way to prepare for getting a full-time job. While doing an internship it’s important for interns to let their supervisor know that they’d be interested in applying for any full-time job openings that come available. From an intern’s perspective, one of the most important things to remember is how to make yourself a productive member of the team and to make sure that you go above and beyond what’s required so as to make yourself indispensable on the job. Networking is also a very important key to getting a job with the government. It’s often not about what you know but who you know that makes the difference between getting hired or not. As an intern, you may have a mentor that can open doors for you if you prove yourself over the course of your internship. A good mentor will make recommendations on what to do and who to contact when seeking opportunities for a full-time job. Reaching out to people already working in the field can often offer insight as to some of the next steps you should be taking. Working for the government offers so many opportunities that there is no limit to what you can learn working as an intern. In addition to all of the opportunities that are considered typical job possibilities, there are also chances to gain employment in government offices that deal with the environment, education, medicine, or even the military where endless internship opportunities are available. Positions are available for students seeking a chance to work as engineers, researchers, teachers in addition to the more customary government internships/jobs such as students involved in political science and pre-law courses. The Student Temporary Employment Program is a short-term opportunity for eligible students interested in working for federal agencies in a variety of areas that may or may not be related to their academic studies. SCEP offers the possibility of longer experiences that are related to a student’s academic field of study. Upon completion of a SCEP experience, students may be eligible for permanent employment. The Presidential Management Fellows Program is considered the Federal Government’s premier leadership development program available for advanced degree candidates. This is a centralized program that includes a yearly application cycle. On December 27, 2010, President Obama signed Executive Order 13562, for "Recruiting and Hiring Students and Recent Graduates". These new programs will not be operational until final regulations are implemented sometime in 2012. Until the new regulations are implemented, agencies may continue using the STEP, SCEP, and PMF programs. New graduates seeking entry-level full-time jobs after graduating from college should check out usajobs.gov. Most positions within the Federal government use the General Schedule (GS) for pay. Applicants can target a job search to the GS levels that are typically considered "entry level" for Federal employment. For example, individuals with an Associate's degree or equivalent will generally be considered at the GS-4, with a Bachelor's degree at the Grade 5 (GS-7 with superior academic achievement), with a Master's degree at the GS-9, and a Ph.D.